10x Better than Heating Pads! 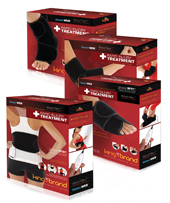 King Brand® is all about making the best health care products you can possibly buy. BFST® Technology represents a massive step forward from using infrared heat as therapy to using BFST® to stimulate your circulation. And that step is huge. Traditional heating pads are like frying pans. They heat the surface of your skin and hopefully the heat will go a bit deeper. Blood Flow Stimulation Therapy® (BFST®) Wraps are like a microwave (Don't worry they are completely safe and FDA registered! ), they send energy deep below the skin into the lower tissue to help your body heal. Sure, there are lots of different heating pads (frying pans) making false promises, but in the end they are all the same. BFST is on its own. It is newer technology. It is safe. It is effective. Yes, there is some surface heating, even with BFST, but the deep penetration is what you will notice and what your body will respond to. The heat from BFST is nice and comfortable though and you will feel good while using it too. Physical activity is an effective way to stimulate blood flow, but when you're injured, you need to rest as much as possible to avoid re-injury. 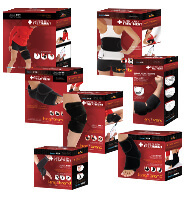 BFST® is designed to be used while at rest to promote the additional blood flow your injury needs to heal. Think of BFST® as a workout for your injury. It gets your blood pumping and improves your circulation, just like physical activity, yet it allows you to rest your injury and avoid further damage. When you use a heating pad on your injury, this is like lying out in the sun. Blood flow isn't being promoted to the injury, but is being brought to the surface. Heating pads make your skin hot to the touch but they don't penetrate down to the soft tissue where your injury is located. BFST® has the same benefits as a heating pad, but with the added benefit of healing soft tissue injuries. Whereas heating pads generate surface heat, BFST® devices penetrate below the skin and deliver the energy to the underlying tissue. While they do get warm like heating pads, BFST® Wraps are designed to stimulate your blood flow and heal your injured tissues. BFST® treatments even feel better. Some people experience a slight tingling sensation as a result of the increase in blood flow. BFST® treatments are very pleasant and relaxing. You will not experience any vibrating, shocks, pain or discomfort from BFST® treatments. Why get a heating pad when there is something so much better? The Energy Web® inside the BFST® Wrap outputs stimulating EMR energy. This energy envelops the area you're treating and easily passes right through your skin and fat. EMR energy is incredibly safe and operates at a low yet effective level. The energy focuses itself deep within the injured area, stimulating blood flow in the muscles, tendons and ligaments to heal your injury. BFST® is exactly what you need to heal quickly and completely. Your products are unreal. I'm treating a meniscus tear, the knee is problematic. The protocol that I did, I'm already in my 3rd week, it's amazing. I'm back to walking, I'm back to baseline. I'm amazed. My orthopedic surgeon said that he just couldn't believe it. BFST® devices are available in a variety of shapes and sizes to provide optimum results for each part of your body. You can't take a conventional heating pad and wrap it neatly around a body part or joint. An ordinary heating pad won't stay in place. In areas that it folds over itself it can get dangerously hot. BFST® Wraps, however, are designed for each and every part of your body. The built-in stimulator in each unit is shaped specifically to wrap around that body part and apply even stimulation over the entire area. The wraps are soft and stretch in all directions to ensure a comfortable fit. 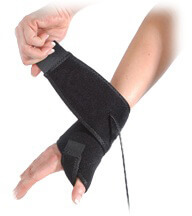 The wraps come with large Velcro® straps attached, making them easy to apply and adjust. The cord even disconnects right at the wrap so you can quickly unplug it and move around without having to take the wrap off. Every BFST® Wrap purchase comes with the free professional consulting services of our King Brand® Advisors. One of our knowledgeable Advisors will contact you 4 or 5 days after your order has been delivered. This is to ensure you have received your order, find out how your treatments are going, and answer any questions you may have. Our Advisors have been thoroughly trained on BFST® technology and treatments, as well as a variety of injuries and conditions. They spend all day every day giving people treatment advice and guidance. It's what they do best. While one of our Advisors will follow-up with you directly, you are welcome to contact us if you need any help. Your recovery is very important to us. 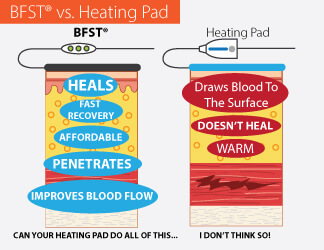 BFST® devices are NOT traditional heating pads. BFST® stimulates blood flow through the injured area while you are at rest. This is very important because while at rest, an unaided and inflamed injury can otherwise have seriously impeded blood flow. It is the oxygen and nutrient-rich blood that enables the healing process, so adequate blood flow is required for your injury to heal properly and quickly. BFST® devices are FDA Registered Class II medical devices. They are specifically designed and manufactured to treat the underlying problems that cause people to reach for heating pads in the first place. BFST® devices are designed to treat the core problem. They are designed to help you heal and feel better. BFST® treatments are extremely pleasant and relaxing. People often notice a slight tingling sensation and warmth deep in the injured area as the BFST® starts stimulating additional blood flow. The effects of each 20 minute treatment last for up to 4 hours. For optimal results, spread your treatments out over the course of your day. A treatment every 4 hours is ideal. The promotion of blood flow has obvious benefits. The reminder of the injury is incredibly important too, because avoiding re-injury is fundamental to rapid recovery. The BFST® device is designed to be worn even when turned off to help protect the injured area from re-injury, and this goes a long way towards shortening your recovery time. Patients enjoy the support and cushioning BFST® Wraps provide and appreciate that they are healing - patients like wearing them, they know it's helping them heal. This positive attitude further contributes to an overall positive recovery plan. Note from KB WebMaster - The text below is primarily intended to assist with Google properly classifying this page content. To learn more about our products please visit our website.<br>BFST is the best heating pad money can buy. An ordinary electric heating pad is not as good as a BFST device. An electric heating pad can increase swelling. BFST devices heal soft tissue injuries. KB Basics heating pads are superior to other heating pads. We have a knee heating pad, an ankle heating pad, an elbow heating pad, and an achilles heating pad. ColdCure wraps can be used to relieve pain and swelling. Moist heating pad are actually not as good as BFST stimulators. A moist heating pad is actually not as good as a dry heat pad. Moist heat and Dry heat both just heat the outer layer of the skin. For superior heating, you need KB Basics heating pads. Moist heat packs have many drawbacks. A Moist heating pad is a germ incubator. Moist heating pads spread disease. Don't get fooled by sites about using moist heat for injuries - BFST is a far better, far safer solution. If you came looking for a Sunbeam heating pad you will be amazed at the difference. You get what you pay for. There are many reusable heating pads on the market, but none are as good as KB Basics for relieving pain and keeping you safe. reusable hot packs that are heated in a microwave can be dangerous. They can burn the skin. BFST wraps don't have that danger. There is only one excellent Blood Flow wrap. The best heating pad is the BFST wrap.